First impressions are everything. The exterior of your business is your first impression to your customer. It is the first thing a customer sees when they arrive at your business. If the storefront of your business looks shabby, ran down or dirty, it will drive away potential customers. Southern Clean Pressure Washing is a professional commercial cleaning company that handles storefront cleaning services in the Kansas City area. Our cleaners will help you keep your business looking professional. 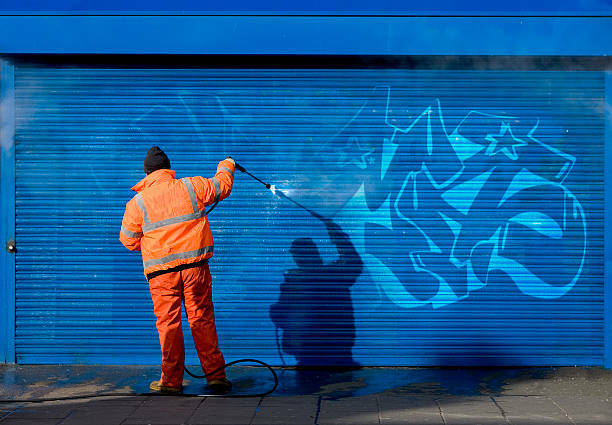 We provide storefront cleaning services in Kansas City that can handle the dirt and grime on exterior features of your business such as sidewalks, concrete, drive-thrus, fences and other hard surfaces. Our professionals have the training and proper skills to safely handle the power washing equipment. Using a high pressured system to wash your hard exterior features is the best way to rid them of stains and dirt. We will have your business storefront looking brand new. We also provide commercial soft washing services to the commercial business owners in the Kansas City area. If you are looking for a professional way to clean the exterior of your business without damaging your siding, this is the service for you. Our cleaners use a soft washing process that involves several steps to ensure the safe cleaning of your siding. To start we use an eco-friendly, chemically based solution on the surface. This solution is left on the area for several minutes to ensure it seems into all the cracks and pores of your surface. Our professionals then use a low-pressure system to rinse this solution from your walls. Our low pressure system puts out about the same amount of water as a regular water hose. This ensures that your siding is not damaged by the high dispensing of hot water. A clean storefront can completely change the way your business functions. Your business contributes to the community through hard work and great service, but you can also contribute to the appearance of the community by keeping your business looking amazing. Our professional storefront cleaning service is a great way to make a bold statement to the community, and it will make your commercial business more attractive to future customers. Our experience and expertise speaks for itself. When you need a professional pressure washing service performed on your home or business then look no further than Southern Clean Pressure Washing. Properly pressure washing any surface requires you know what pressure washer to use, which chemicals to use for each surface and most importantly how to handle a pressure washer and not cause damage to the property. Pressure washing machines can cause severe bodily and structural harm when handled by a non professional. So give us a call or schedule a free estimate online today to get started on having your property properly pressure washed. Southern Clean Pressure Washing of Kansas City is committed to providing high quality service, customer service excellence.